The AK Brake is designed for all Standard AK platforms with 14mm x 1 LH Threads. 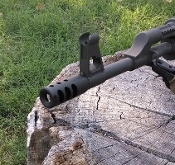 The AK Brake can also be installed on a barrels with the use of a Shim Kit for timing. Top slot for use with detent as well as wrench flats on front of brake.